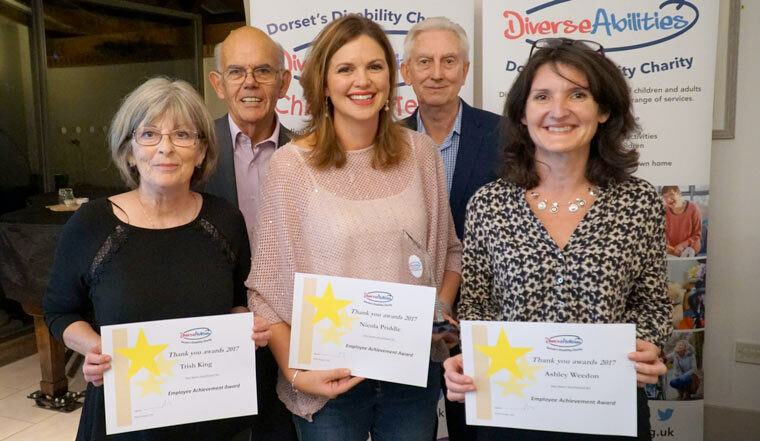 Diverse Abilities recently hosted its annual Thank You Awards at the Italian Villa at Compton Acres in Poole to acknowledge inspiring people connected to the Dorset charity that supports children and adults with disabilities. The award categories included Employee Achievement; Corporate Supporter; Individual Fundraiser of the Year; Volunteer of the Year; Staff team who’s gone Above and Beyond; Individual the Charity Supports Who’s Achieved Something Remarkable, and Outstanding Contribution. Winners at the ceremony included Purbeck Ice Cream, in the Corporate Supporter category, because of how generous the local company has been by providing free ice cream to all charity services on a weekly basis. This has put a smile on the faces of children and adults with disabilities. Ice cream is very sensory and the flavours, smell and texture can be enjoyed by everyone, even those that can’t eat solid foods as they can enjoy the cold sensation. Nicola Priddle works as a teacher at the charity’s special school Langside and was the award winner in the Employee Achievement category. During the past year, Nicola has taken on new professional challenges, as well as supporting and engaging with the wider charity’s activities, entering fundraising events and encouraging others to get involved. A number of children and adults supported by the charity won awards for achieving something remarkable. One winner was Colin who attends Barnabas. He wanted to raise funds for the charity and decided to take on a sponsored swim. He set himself a target of 50 lengths, which is a big challenge for him in particular as he only has use of one arm. Not only did he achieve his target, he also raised a fantastic £300.